The Paris Agreement was widely hailed for drawing all nations together to tackle climate change, based on bottom-up contributions that will be reviewed and strengthened over time. These contributions are aimed at achieving the ambitious but necessary long-term goals of limiting global temperature increase and building resilience to climate impacts. This process is known as the ambition mechanism, and the first test of whether and how it will work is fast approaching. In 2018, Parties to the UN Framework Convention on Climate Change will come together to take stock of progress and identify where they can go further, faster to put the goals of the Paris Agreement within reach. At the 2015 climate summit in Paris, countries agreed to limit warming to well below 2 degrees C (3.6 degrees F) above pre-industrial levels, and to pursue efforts to limit it to 1.5 degrees C (2.7 degrees F). 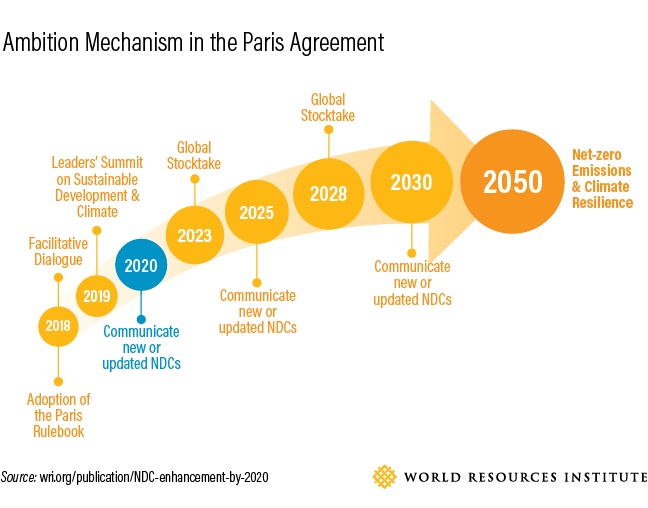 The current NDCs, by contrast, would lead to warming in the range of 2.7 to 3.7 degrees C; there remains a significant gap between emissions expected in 2030 and emissions compatible with the Paris goals. The longer countries wait to bring their commitments into line with the Paris goals, the more difficult it will be and the steeper the rate at which emissions will need to decline. Because fossil-fueled power plants and inefficient buildings have long life spans, achieving an ever-steeper reduction rate can become expensive and technically difficult. The sooner NDCs reflect the necessary ambition to achieve the Paris goals, the sooner they can signal to redirect investments away from high-emitting technologies. The current NDCs were developed by Parties ahead of Paris, quickly and with no certainty of the final outcome. With the Paris Agreement now in force and with implementation guidelines to be finalized at the end of 2018, Parties can factor in recent innovations and declining costs of renewable energy to take advantage of opportunities in key sectors to send accurate signals to investors. Many countries have long-term plans and strategies related to climate, development, and economic objectives. Taking the opportunity now to align NDCs with these long-term goals and strategies will avoid locking in high emissions that will exacerbate climate vulnerabilities. For example, analysis has revealed the high potential for synergies between achieving the Sustainable Development Goals and the NDCs. Enhancing NDCs provides an opportunity to rally support for climate action, strengthen public participation and ensure that relevant stakeholders help to create a strategic vision. The opportunity to review and update the NDCs by 2020 enables Parties to learn from their initial experience and identify ways to engage a broader range of stakeholders to access new information and enhance ownership of the NDC, within and outside government. Enhancing engagement with businesses and other non-state actors, as well as subnational governments, could also reveal additional mitigation potential or innovations that help drive enhanced ambition. Updating NDCs by 2020 will also kick-start the virtuous cycle of ambition at the heart of the Paris Agreement, inducing greater ambition from other Parties thereby leveling the playing field in a globalized economy. 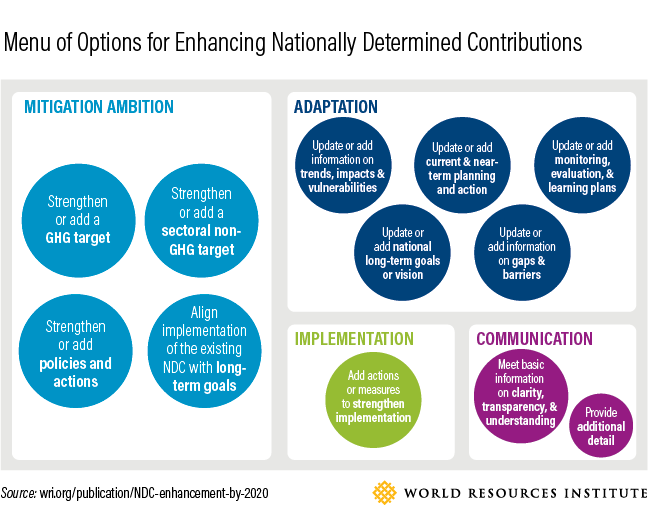 The options cover ways to enhance mitigation ambition and strengthen NDC content on adaptation and implementation and to improve the clarity and transparency with which NDCs are communicated. These options are not mutually exclusive. In many cases, it will be feasible and desirable for a country to strengthen mitigation ambition as well as other facets of their NDC by pursuing multiple options at once.